Nantucket is fortunate to have any ponds at all. Before the last glacier to smother most of North America, during the Wisconinan Glacial Stage of the Pleistocene Epoch, slid down over the landmass of what would become Cape Cod, Nantucket, Martha’s Vineyard, Nantucket Sound and Vineyard Sound, the East Coast’s coastal plain stretched from the mainland out to the edge of the Continental Shelf where the ocean was. This glacier, the Laurentide ice sheet, so named for the St. Lawrence region of Canada where it originated, reached its southernmost extent around 21,000 years ago. The easternmost portion of this glacier’s Cape Cod Bay lobe that formed Nantucket stopped along a crescent line where the Middle Moors would be. The middle of this lobe ran around 20 miles south of the western half of the island before it began to retreat. In addition to bulldozing sand, gravel and boulders into a low ridge that would prove tall enough to become Nantucket’s three islands once the ocean rose high enough, this last glacier scoured, punched and eroded the new island underpinnings of sand and gravel with depressions that eventually became three of the four types of ponds on Nantucket, the fourth being manmade. Where the glacier left behind massive chunks of ice, generally in the north central section of Nantucket with a few spots west of town, kettle holes or, kettle ponds were formed. As the stranded icebergs melted, meltwater flowing southward from the receding glacier built up sediments around them forming their eventual shores. With the melted ice long gone from these kettle ponds with names you’ve probably heard such as Gibbs, Donut, No-Bottom, Sesachacha, Jewel and Almanac, all kettle ponds’ water levels depend on the amount of precipitation Nantucket gets. Hence, low ground water from lack of rain and snow means lower kettle pond levels. The opposite is true for excess precipitation. This hydrologic dynamic is why Almanac Pond is so named. Early island settlers and Native Americans alike used the kettle ponds as an alternate method of determining the seasons. Ice meant winter, a full pond overflowing its banks; spring, low water; summer into early fall and fuller ponds as fall rain and winter snow start to fill them again. Some lucky kettle ponds are underlain with clay deposits making them into perched wetlands meaning their contents are mostly immune to ground water fluctuations. Streams of glacial meltwater flowing across what would become Nantucket and out over the coastal plain to finally cascade down over the edge of the Continental Shelf into the ocean are the sculptors of the outwash ponds along the south shore of the island. Ponds named Hummock, Miacomet, Long, Tom Nevers and the two Weweeder’s, Reedy, Mioxes and Sheep all began as the headwaters of chilly ice rivers running from the melting glacier approximately 75 miles south to the ocean. As all ponds are gradually filling in with the vegetation growing in and around them, some faster than others, Nantucket has several outwash valleys that used to be ponds but are now in varying degrees of conversion to upland terrain, retaining some pond qualities during the wetter parts of the year. West to east, these include Mioxes Pond and the westernmost of the two Weweeder ponds, Madequecham, Toupshue and Forked Pond valleys. These outwash streams along with the aforementioned outwash ponds above emanating from the glacier became ponds when the ocean level came up 6,000 years ago and pushed sand into what remained of these meltwater flows, stopping them from discharging any more water. Very gradually over time, they’ve filled in with vegetation. As most of these outwash valleys stretch at least halfway across the island, they act as collectors of water and whatever’s in it in their respective watersheds, feeding down into the lowest parts of these former outwash avenues, which in many cases are ponds. Four of Nantucket’s ponds are tidal, Haulover Pond and Coskata Pond on Nantucket Island, and North Pond and East Pond on Tuckernuck Island, all them twice daily exhaling saltwater rich in carbon dioxide, marine and avian animal wastes and other natural detritus, and twice daily inhaling fresh oxygenated water with new batches of food for their marine life. Coskata and Haulover ponds grew out of post-glacial deposits carried north along the east shore of the island starting at the birth of these islands and completed several thousand years later. 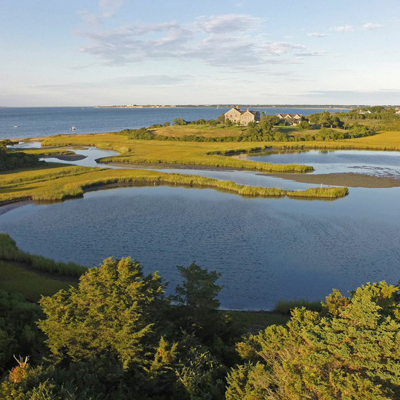 Coskata Pond happened because the sediments running north via littoral drift connected with an area of heavy gravel and clays, the foundational material of a small island just off of the fledgling Nantucket where Coskata Woods is today. Sediments carried beyond this point to another small island north of there where Great Point is today. A southwest ocean current eventually built Coatue and the small tidal pond that had formed northwest of the woods is Coskata Pond. A winter storm in December 1896 plowed a channel between the Head of the Harbor and the ocean that eventually carved out Haulover Pond. Over a 12-year period, the south shore of the channel grew north because of the northern flow of sand up the east side of Nantucket while the north side of the channel eroded north. When the eroding side and the building side hit the heavier soils of Coskata, the channel filled in with sand and Haulover Pond was born. East and North ponds on Tuckernuck Island formed much in the manner of Coskata and Haulover ponds: by the movement of sediments along shoreline to encapsulate bodies of water. Beach vegetation has taken hold on the on these sediments allowing dunes to build up, creating a permanent protective shoreline protecting these ponds from the ocean.